A bespoke plinth can be made in any size and shape. Starting with squares and rectangles, oval and round, to pyramid or other shapes which you would like designed. The smallest dimension is usually 10cm on one dimension. The donut shape plinth was designed by a client who wanted a floral display plinth that would stand out as being different rather than the traditional square / rectangular plinth. The client needed to make sure that the top for the display of the flowers was 24cm deep and 32cm wide. The edges were rounded to give a completely smooth finish and spray finish it white. 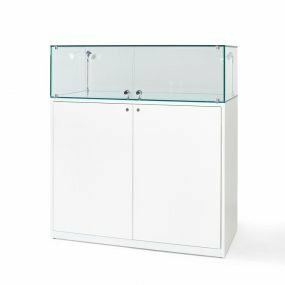 This lectern was created for Speedo who had spray finished MDF creations for the top and bottom pieces, with two glass pieces through the centre. The logos were contour cut vinyl graphics and applied to the glass. We are able to make many bespoke pieces with glass, with our UV Bonding facilities. Puma had exhibition plinths with an opal acrylic lit base for the shoes to stand on, and cutout lettering for the lighting to shine through. The covering is an acrylic case, a 5 sided cube which was fixed to the plinth which was rebated at the top by 10mm. This was a piece which we received full design drawings for in order to make the manufacture absolutely specific to the design brief sent to the agency. Courvoisier HQ in Jarnac, France had 2.5m Curved Reception desks made in black high gloss spray finish. The plinths were manufactured as part of a refurbishment where we worked closely with a visual merchandiser on the finished products. These plinths were created to display product information so they were made with slanted tops for Waitrose. The graphics on the front piece were again contour cut vinyl logo. Crack The Code Acrylic Case was made for Swatch Group, who place a watch inside and their customers purchase tickets with codes on them which enables them to win the watch. These were placed into retail environments in trial stores in the UK and Ireland. 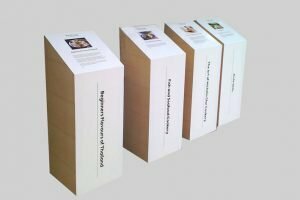 What Is The Lead Times On Bespoke Plinths? Bespoke plinths, depending on the quantity and size start from a 2 day lead time. If you would like different designs, drawings and options the entire quotation process could take up to 2 weeks. 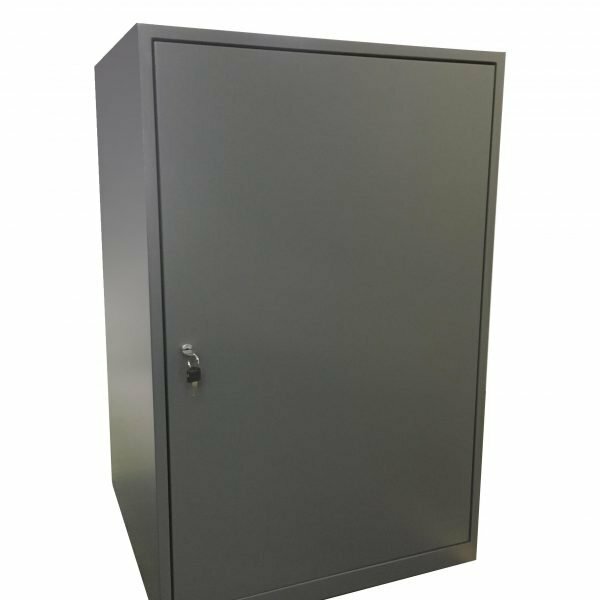 We recommend that for large bespoke orders we start to work on them 8 weeks in advance so that we can complete the contract you propose for the delivery date provided. If you would like something delivering very quickly, we do have a team who can work overtime. We may offer you the option of having overtime to complete your project and will advise this at the quotation stage. Can I Have Bespoke Colours? You may have any colour that you wish to match to your branding. We use car spray paint, which can be matched to a Dulux colour code, a RAL colour or a pantone. Some customers will send their logo and ask us to extract the relevant colour from the logo to have the plinths matched to. Sizes from 100mm are available, the largest we have manufactured and sprayed to date have been 3.5 metres. 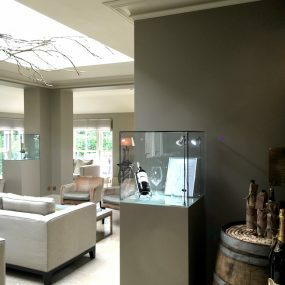 In terms of different shapes, our oval plinth and iPad plinth which are now in standard stock began as a bespoke enquiry. We have manufactured Do-nut Shape Plinths, Round Plinths, Plinths which lean to one side, and we are more than happy to hear your bespoke idea to find a solution for you.